Classical music with a pop edge. This can only be Nicola Cassells. Nicola Cassells is a rapidly rising star with a recently released debut solo album "Somewhere in Time" is causing a major stir in the music and events industry. This outstanding young musician is part of the new wave of classical singers crossing over to mainstream events. 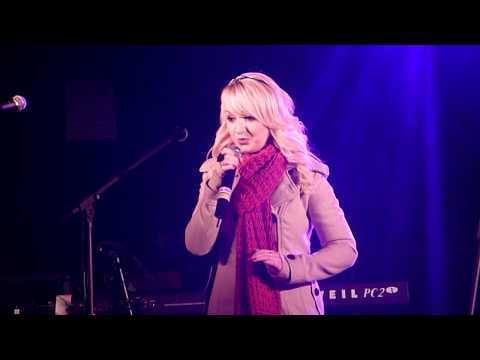 Hireaband is proud to represent Nicola Cassells for live performance engagements. If you are looking for an elegant performance with a contemporary feel for your next event then you need to talk to us about Nicola. We can't think of a better way to add the Wow factor to any evening or event, and with a repertoire of stunning songs at her disposal, your guests will be in for a major treat. Your event deserves this level of performance! Breaking news. Nicola is now in demand to sing the National Anthem at major sporting events, having already sang it at the New Emirates Arena in Glasgow and the Scottish Grand National. (The SFA have also been in touch). Enquire Now for a free quote, or why not add Nicola to your shortlist of favourites. Sorry, Nicola Cassells doesn't have any photos right now Send us an enquiry and we'll get back to you, or check out the rest of the act profile. 3.Parla Piu Piano (love song from the Godfather). 8.Above six tracks are taken from her debut EP called 'Somewhere in Time'. We don't have any reviews for Nicola Cassells yet. In the mean time, check out our profile or listen to some of our samples.